Strainers - Heavy duty in-line, 2 holes in spindle. Can be tightened with 9/16" wrench. Strainer Handle, fits most brands. 1 5/8" between ears. 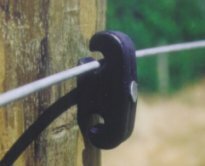 An in-line wire tightener that can be installed anywhere on the wire to tighten already installed wire. Needs 1/2" square drive ratchet to tighten.